Slime has been a mainstay at our house for the past two years. And while I don’t love the sticky mess left behind in bowls and on spoons, I have to admit that the stuff is fascinating. And, pretty harmless. Because no matter how hard and gunked-up leftover slime gets, I can dissolve it all with vinegar. Which made me wonder - what exactly is happening when vinegar comes in contact with slime? First, a quick slime primer. Slime is a weird substance, acting alternately like a liquid or solid depending on the presence or absence of pressure. It’s like quicksand and ketchup - more details here. That happens because slime is made of glue (a polymer, or long chains of repeating molecules), plus an activator or “cross-linker” like borax. The polymers in the glue and the borate ions (formed when borax dissolves in water) start to link up, stopping those long chains from easily sliding past one another as they had done before. And then, drumroll……. vinegar enters! Add a decent splash of vinegar, and the whole thing goes liquid. Vinegar dissolves lots of stuff - remember the old egg-in-vinegar experiment? In that case, the acetic acid in vinegar reacted with the calcium carbonate in the egg shell, producing carbon dioxide gas and turning the shell rubbery. With slime, vinegar breaks up those cross-linking bonds… and frees whatever the slime was stuck on. So keep making that slime. Just keep some vinegar nearby. I’m so excited to pull back the curtain on what my scientist-artist friend, Molly McAllister, does for work. As an associate scientist at NCAR (the National Center for Atmospheric Research), Molly is a true left brain/right brain thinker and excels at sharing the nitty-gritty details of science in an understandable way. And, she keeps it all fun! 1. Describe what you do: I’ve spent my career supporting scientific researchers, policy makers and the public in their pursuit of better understanding the physical world. Right now, I support people around the world who are using a massive, cutting-edge hydrologic model that predicts how water interacts with the landscape after it falls from the sky. This model helps scientists and the National Weather Service predict stream flow, forecast flooding, manage water supplies and study climate. For instance, when Hurricane Harvey hit, the model was used to help determine where it was wet, where it was dry and where emergency services could go. I work as the connection between the people who develop the model and the people who use it. 2. How and why did you get into this field? Growing up, I loved watching storms rolling in from across the acres of my family farm. The towering clouds, the crack of the thunder, the pitter-patter of droplets or ice. And then, the beautiful colors that arced across the sky as the sunlight filtered through. At night, I would lie out on my trampoline and gaze up at the Milky Way, always searching for Orion's belt so that I could peer into the Great Nebula and witness the birthing of a star. Simply put, I’d go outside, look up and wonder. I’d think, ‘Wow, how did the stars get there?’ Or, ‘Look at the clouds – how do they form?’ My love of light and water, in all of their forms, and my innate curiosity eventually led me to study remote sensing, which is about using different wavelengths of light to understand the environment around us. Those same curiosities led me to my work now with a water model. 3. Describe an interesting application of your field: Everything gives off energy and has a spectral signature, or a certain way that light reflects off of it - you do, I do, the cat does, that rock does. We try to build sensors to read those different signatures for the planet so we can see what it’s telling us – where it hurts, where it’s okay, where it needs help. We can determine things like crop health, whether an ice sheet is going to fall apart, if an area is experiencing drought. You can literally see the earth breathe by watching the evapotranspiration of the Amazon rainforest or visualizing global CO2 levels. 4. What's your typical workday like? I start my day outside by biking twelve miles to work. Then at the office, I work with a team of scientists and software developers to document their software. I help people understand how to use the model via email and in person, and I work with our sister agencies to coordinate hands-on workshops. 5. Describe your workspace: I have my own office with a stand-up desk, which is very important to me, and a large window that overlooks a big tree. I have a plant named Franti and colored boxes that are in Chi directions to make sure energy flow is good. I have photos of places I’ve traveled (I’m also an avid photographer and traveler), and photos of different forms of water (clouds, rivers, snow). Our building is filled with office spaces, lecture halls, and a cafeteria, areas that are designed for sharing ideas and having discussions. 6. Do you have any favorite scientists, engineers or programmers? Einstein, for sure, and also Leonardo da Vinci. Not only was he a genius, but an artist, scientist and inventor. I like to think of myself as a fellow polymath, or someone who excels at a lot of different subjects. Some people are specialists, but I gravitate to variety. Art is just as valuable as science, and there’s an art to science and a science to art. A mathematical proof is a work of art. It is beautiful. I am also inspired by the doctor Patch Adams. He connected laughter, joy and fun into the healing process and overall health. That has been a major influence overcoming issues throughout my life. 9. What’s something else we should know about you: For me, variety is the spice of life. Besides my day job, I also teach water aerobics and pottery. I am an avid salsa dancer. 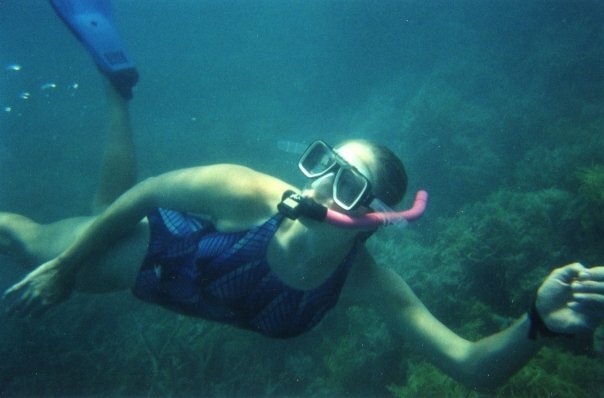 I love the feeling of being suspended in air or water. I take every opportunity I can to be up in the air, hangliding, paragliding, and jumping on trampolines or in water swimming or kayaking. Most important, I try to approach everything I do with a sense of joy. There’s a lot of joy and fun in life. Sometimes you just have to find it. I'm not sure how you feel about seagulls. Love 'em. Hate 'em. Don't care. At all. I've always seen them as a bit pesky. With all the caw-cawing and waiting for dropped food and such. Kind of like I used to see crows, until I learned that, far from being pesky, they're just really, really smart. Turns out seagulls aren't so dense either. Check out these seagull facts and see if maybe your "eh" turns into "love." -Gulls have been seen using tools: for instance, a herring gull used pieces of bread to bait fish. When dropping clams and mussels onto rocks to crack them open, they know to drop heavy ones from lower heights and lighter ones from higher heights. And they're crafty, able to steal fish from other seabirds. Like pelicans, which have to drain water from their beaks before swallowing their catch: gulls wait nearby, and move in for the fish when they have an opening. -They use a complex system of communication - lots of different sounds, and body movements, too. -They can drink sea water: glands above their eyes flush excess salt out through their nostrils. -They eat almost anything: fish, sea life, bugs, rodents, eggs, dead animals, plants, trash. To figure out what is edible, they have to use some brain power. -Gulls are fantastic fliers. Don't take my word for it: watch as they hover motionless on a windy day. -They have a highly developed social structure and nest in large colonies. They work together to mob predators and intruders. And while seagulls are monogamous, pairs sometimes split (usually over disagreements about raising a family). Divorcees may suffer social costs a few years after the split. Not sure if that's enough to change your mind, but I'll look at these birds differently the next time I'm at the beach. I'll probably look at pelicans differently, too: a few weeks ago, while I was sitting on the deck of a rented beach house with my cousins, one pelican flew overhead and unloaded on me. I was splattered from head (the gunk just missed my eye) to toe (my pants-legs were covered). Just call me Princess of the Pelicans. I'm thrilled to welcome my very first blog guest - and even better that it's my own sister. Karen is a Linux Cloud Support Engineer at Amazon Web Services, a subsidiary of Amazon (ever heard of them?) and spends her days coding her way around various projects. Check out what got her into computers below. This is the first in a series of blog interviews I hope to do with people in science, tech, engineering and math (STEM). If you would like to be spotlighted or know anyone who might be interested, let me know! 1. Describe what you do: Currently, I maintain an Amazon Web Services database, as well as an internal website I developed that provides data analytics to help make decisions on where to improve and focus efforts. Creating the website was a big accomplishment for me because I wrote it in the language Ruby on Rails, which I had never used before. I also write scripts in Bash, Ruby and Python (all good languages to learn if you want to get into tech) for automating tasks. 2. How and why did you get into this field? This sounds silly, but watching Angelina Jolie in the 1995 movie Hackers inspired me to get into technology. It was eye-opening at the time to see how much of an impact computers have on our society. Computers give everyone – including people who were born into difficult circumstances – the chance to teach themselves all kinds of skills, including technology, and even become billionaires and/or make great discoveries and contributions to science in the process. 3. Describe an interesting application of your field: There’s a Linux-based operating system for phones and tablets (NetHunter) that lets people do pen-testing (or ethical hacking) from their mobile devices. It’s much more discrete. Occasionally when I see someone glued to an android phone or tablet, I wonder if they might be using NetHunter to test out some ethical or not so ethical hacking techniques. 4. What’s your typical workday like? Nerf gun wars, petting cute dogs people bring into work, coding my website, crashing my website and breaking my computer. I also go to meetings and resolve issue tickets. And I code a lot. Sometimes I code all day, then when I get home, I code some more. It gets addictive when you’re trying to get something to work. 5. Do you have any favorite scientists, engineers, programmers? Linus Torvalds is awesome. He wrote an entire operating system kernel that became the Linux Kernel at the age of 21. He’s a great example of someone who changed technology at a young age using computers along with his knowledge, innovation and persistence. (And also became a multi-millionaire.) I love that he made his operating system, Linux, open source so anyone could view it and contribute to it. I think open source is cool since it’s customizable, very powerful and usually free. It fosters innovation and allows people to share ideas. Everyone can learn from it and be inspired by it. Just like anyone can read a copy of one of Shakespeare’s plays and get inspired. Code. It can be like... art. 6. What’s an equation or discovery that you really love, and why? Compassion is a form of intelligence. This is important to remember with the development of artificially intelligent machines. Just because you create something with artificial intelligence, there’s no guarantee it’s going to be compassionate. The movie “Transcendent Man”gets to that idea, that if we create machines that are billions of times smarter than us, they might see us as mosquitoes and wipe us all out. And quantum physics is exciting and interesting to me because it makes no distinction between past present and future, which has some fascinating implications. For instance, if it’s true, it means everything is happening at once, that time is a human construct. 8. How has your working computers helped you with a "real life" problem? Before I got into technology, I was scared to fix anything - from a remote control, to a computer, to the dishwasher - because I was worried that I'd break it. Now, working in this field, I see that everyone ends up breaking things. That's just part of the process, and a lot of times, that's the most powerful way to learn. And, if you never try, you'll never fix anything. So that's helped me try. Frogs live all over the world: from rainforests to deserts, and from the suburbs to the Arctic Circle. Which means they have to withstand some pretty cold and pretty hot weather. And that brings us to two cool things frogs can do: they can hibernate through the cold, or estivate (go dormant) through the heat. In hibernation, a frog finds a safe place to hangout all winter, then its metabolism slows dramatically. A land frog might dig a burrow to get below the frost line or crawl into a crevice and cover itself with dead leaves. A water frog might sink to the bottom of a pond and partially immerse itself in mud, but not too much to cut off all the oxygen soaking through its skin from that H2O. Some frogs can survive being frozen: though ice crystals may form under their skin or in their body cavities, they've lowered the freezing point of cells in important organs by pumping in extra glucose so those don't turn to ice (sorry, Elsa, they have you beat on this one). The frog no longer breathes, its heart no longer beats; and yet, as soon as it warms up, it comes back to life. In super hot areas, some frogs estivate, which is similar to hibernation. They burrow into the soil and go dormant, shedding several layers of skin over the months that follow. These layers of skin form a tight barrier around the frog, keeping moisture from evaporating. 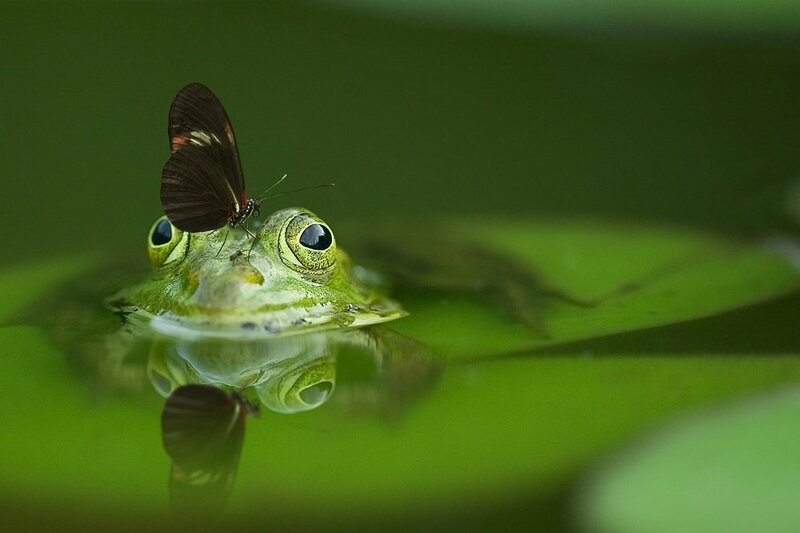 Only the frog's nostrils are exposed to air, allowing it to breathe. In addition to these special skills, frogs can drink and breathe through their skin, have tongues that attach at the front of their mouths, and have teeth. Some are nearly see-through, some can almost fly, and one type has enough poison in its skin to kill 10 to 20 men. So, yeah, frogs are pretty interesting. I might just have to start another blog category about them. Alice Eastwood was a self-taught botanist who published more than 310 science articles, authored 395 scientific names for land plants, and once risked her life to save her plant collection. Granted, these weren't just any plants - these were type specimens: an example of a species that clearly shows that species' defining features. And there were around 1,500 of them. But still, she risked everything to save her work. It was 1906 in San Francisco. Early in the morning on April 18, the massive earthquake struck, resulting in widespread fires that consumed hundreds of city blocks and destroyed thousands of buildings. A small group of staff and curators with the California Academy of Sciences worked to save what they could. For Eastwood, who was procurator and head of the Biology Department, that meant entering the burning building, climbing to the sixth floor on a metal railing, and saving her type specimens. The feat was possible not just because of her bravery, but because she had used an ingenious new method to store her specimens: she had segregated the type specimens from the rest of the collection. "My own destroyed work I do not lament, for it was a joy to me while I did it, and I can still have the same joy in starting it again." I can't help but think that her perspective applies, in a small way, to writing. We can spend hours crafting and cutting and writing and revising a piece that never makes it past our own computer screen. It may not be destroyed by a fire, but it's abandoned to languish in a series of 1s and 0s, or possibly in a stack of papers stuffed into a closet. And yet, if we have Eastwood's perspective - that though a piece may be lost, it gave us joy while we did it - well, that changes everything. It's especially motivating for me as I consider the six books I've written over the past eight years, all of which may never see the light of day. Joy in the process, joy in creating - there's value in that alone. And by the way, after that fire, Eastwood kept collecting. By 1942, her collection hit more than 300,000 samples... three times the number of specimens that had been lost. Alice Eastwood may have seen views like this as she led Arthur Russel Wallace up Grays Peak. Spring where I live means muddy trails, gray skies, spring snowstorms and (maybe) a few patches of green grass. It also means tree buds, which caught my attention this year. Except, in an effort to learn about tree buds, I found out that the buds have actually been around since the fall, when trees have their last big hurrah of growth and prepare for winter. A good reminder for me that sometimes I only notice what I'm looking for. The whole experience made me wonder how trees can survive winter: sub-zero temperatures, feet of snow, blizzard conditions, with no warm cave or burrow to escape to. It turns out trees actually enter into a dormant period over winter. Before winter, they make a growth regulator called abscisic acid (ABA) that halts their growth. Some trees dehydrate their cells, pushing water out of the cell and into the spaces between: there, it can freeze without damaging the cell. 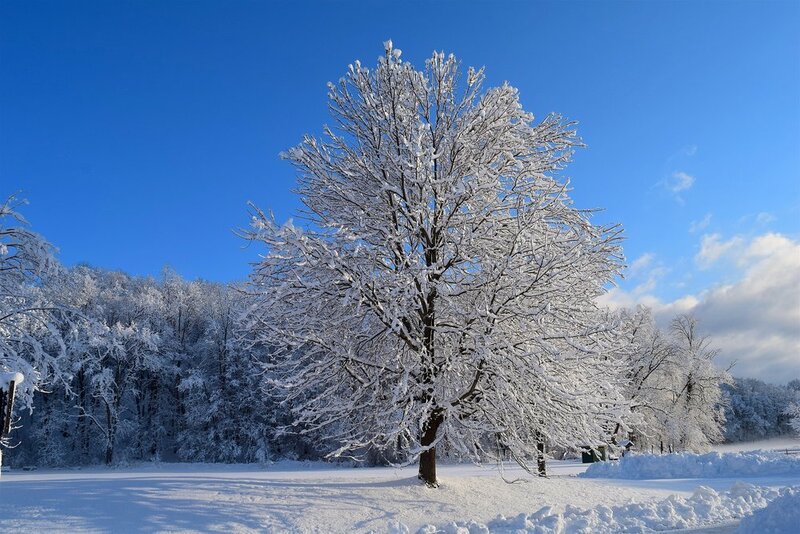 Other trees beef up the number of minerals, hormones and other solutes in their cells, lowering the freezing point to prevent freezing. That still isn't always enough, as evidenced by trees that crack or "explode" in frigid temperatures. But those efforts get most trees through the long, cold winter months. Now back to the tree buds. Cut one open, and you'll see tiny leaves, ready to grow as soon as days lengthen and temperatures warm. I love that, how a bud contains everything needed for broad, green leaves, just waiting for conditions to be right. And it reminds me of how writing sometimes feels. Like something is there under the surface, not quite ready to appear. Creativity, like creation, is cyclical. Periods of intense growth and productivity are followed by periods of... nothing. In writing, I love the first draft part the most, when thousands of words are hammered out and cloudy ideas slowly take shape. Revision is harder for me (though sticker charts help). But the hardest is when I have no writing to do. My creativity seems spent and no new ideas are prodding me on. Books are out to editors, waiting for revisions to return. And I muddle through the days, thankful for my part-time jobs, wondering whether I'll ever write another creative word again. That's when I need to remember that there's a rhythm to creating. There are seasons - winters followed by springs, ups followed by downs. Even trees rest through winter. And maybe those dismally unproductive periods are actually necessary to prepare for the next spurt of growth. After all, the buds of the next project are likely there, just waiting for spring. Days are longer, the sun is brighter and the snow is slowly melting away. But I can't help remembering how a few weeks ago, on a bleak, frigid February afternoon, I watched a group of ducks paddling along the icy river through town. The ducks were surrounded by snowy banks and sections of thick ice. And as my own breath came out in crystalline puffs, I wondered how they stayed warm. I wasn't worried about their bodies - yes, the air was frigid, but they have down coats for that. I was more curious about their thinly webbed feet that were submerged in the icy water. After a bit of research, here's what I learned. Ducks have a counter-current heat exchange system: the warm oxygenated blood flowing to their feet passes close by the cold, waste-carrying blood returning to the heart. It's a finely webbed system of arteries and veins that allows the birds to efficiently recapture heat. Since the blood in their feet is already cooler, they don't lose as much heat to cold water. All to say they're not wasting too much energy keeping their feet warm. But their feet are still chilly: the blood that circulates through is just warm enough to prevent frostbite. And that's surprisingly okay with these birds. Their legs and feet are mostly free of soft tissue. Even the muscles that operate the foot are higher up in the leg, connected to the foot bones by long tendons. So their feet don't need much warm blood. And if they get too chilled, the ducks can pulse extra blood to the foot through valves in leg arteries, providing the needed warmth and preventing frostbite. Believe it or not, this whole system is also helpful in warm weather. Birds can forage in water hotter than their body temperature as the counter-current exchange keeps their feet cool. This also explains why the Great Flamingo, which has very complicated branching in its arteries and veins, stands on one foot: it's limiting its exposure to heat through its feet. This same system is found in the flippers of whales and sea turtles, as well as some reptiles. So the next time you stand at an icy pond and watch ducks paddling along, there's no need to cringe and shiver and worry why those little feet don't turn into icicles. Instead, you can tuck your hands in your pockets, watch your breath cloud in front of you, and marvel once again at intricacy of nature. First things first: I have no idea whether porcupines are actually tender-hearted. They're very solitary animals - they have those fancy quills for protection, so don't need to live in groups for safety. Maybe that's part of why I like them so much. 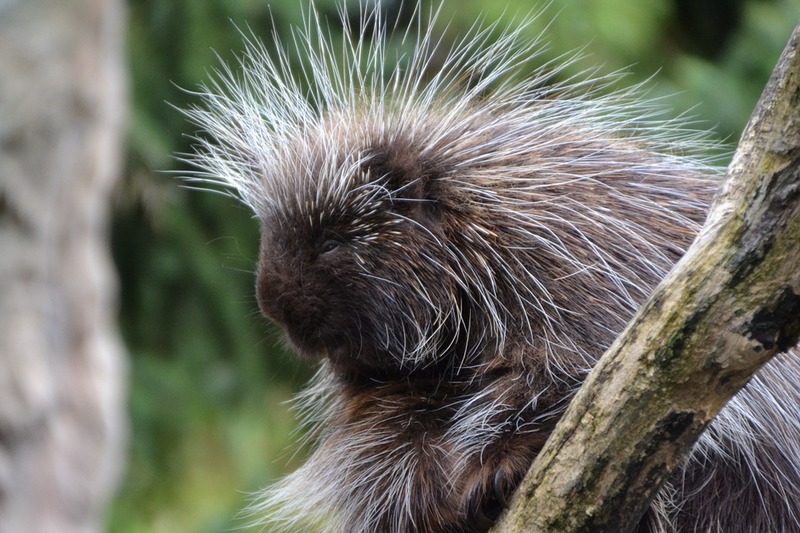 Just yesterday, I saw a porcupine in a tree while running on our bike path in town, and so I decided it was as good as time as any to give a few interesting facts about our prickly friend. As the second-largest rodent in North America (the beaver is first), they seemed deserving of a post. Plus, they held the title for longest living rodent (27 years) until a naked mole rate turned 28. Alas. First a clarification: there are Old World porcupines that live in Europe, Asia and Africa; these guys are mostly bigger (one type weighs up to 60 pounds) and stay on the ground. But I'm going to focus on the New World porcupines that live in North American and South America. They're a bit smaller and are really good at climbing trees. So if you want to spot a porcupine, try looking up. Porcupines are stout, round creatures, and have several defense tactics. Their quills are the main one, a type of "aposematic" defense (which just means predators can see the defense and so are warned). Their 30,000 quills are sharp, hollow, modified hairs that are coated in thick plates of keratin. Contrary to popular belief, a porcupine cannot shoot its quills at you, so you're safe getting somewhat close. But if you touch a porcupine, its needles slide out of its own skin and into yours quickly. Since the needles are barbed, they are a challenge to pull out. Just ask my dog. When mating, porcupines hold their quills down so no one gets hurt. But porcupines keep antibiotics handy (in their own skin) to deal with repercussions of the inevitable tree fall. Also interestingly, when they raise their quills, it makes a white stripe along their dark brown or black body, similar to a skunk. Porcupines can release their own stink and do so as another warning, after they've raised their quills and chattered their teeth. If all else fails, they can attack, positioning their prehensile tail towards the predator and swinging it to get as many quills as possible lodged into the predator's face and body. Porcupines are slow-moving, nearsighted and most active at night. Supposedly, they are also smart. One source said they can learn a complex maze and remember the solution up to 100 days later. If you're lucky enough to see a porcupine, take a moment to observe it. You don't have to watch for long, as it likely won't move fast or far. But it's still pretty cool. After all, how many animals are covered with a coat of long, prickly needles? One more thing my writerly self likes about them, as it seems important to maintain a tough exterior when doing anything creative. And yet just as important to keep your insides soft. One of my favorite times of year is early summer when the ferns begin to grow. Within weeks, they've sprouted up high, sometimes reaching above my chest or head. Their tall, lanky forms make tunnels of green over trails and bite at my arms and legs as I barrel down on a mountain bike. These vivid plants, with their coiled fiddleheads that expand into large leaves, have been around for millions and millions of years. And though they're most commonly associated with moist woodsy environments, they can live almost anywhere, from high mountains to dry desert rocky surfaces, often adapting to flourish in places where other plants cannot. Ferns do not produce seeds or flowers. Rather, they reproduce by tiny spores, which are released from underneath their fronds and have half the number of chromosomes needed for a mature plant. Once a spore is set free, it can develop into a thin, heart-shaped structure (gametophyte) that makes both sperm and eggs. The sperm are mobile, actually swimming through water left by rain or dew to fertilize the fern egg. -The interrupted fern (Osmunda claytoniana), an excellent example of "evolutionary stasis" as it has not changed (nuclei and chromosomes included) for at least 180 million years. It's common name refers to the gap in the middle of the frond blades, which is left after fertile portions wither and die. -Resurrection ferns, which can survive long droughts (possibly up to 100 years). During a drought, this fern will curl up its leaves and dry out, turning a gray-brown color. But when just a little water appears, the fern uncurls and opens, quickly restoring to a vibrant green. Studies have shown they can lose almost all their water (even up to 97 percent) and still live; most other plants would die after losing 8 to 12 percent. Ferns are not without intrigue. In the Victorian era, there was a craze for collecting ferns and using ferns in art. And there are various legends about ferns: in Slavic folklore, if you see a "fern flower" you will be happy and rich for the rest of your live. According to Finnish tradition, anyone who finds the seed of a fern in bloom on midsummer's night will be able to travel to the place where will o' the wisps mark hidden treasure. 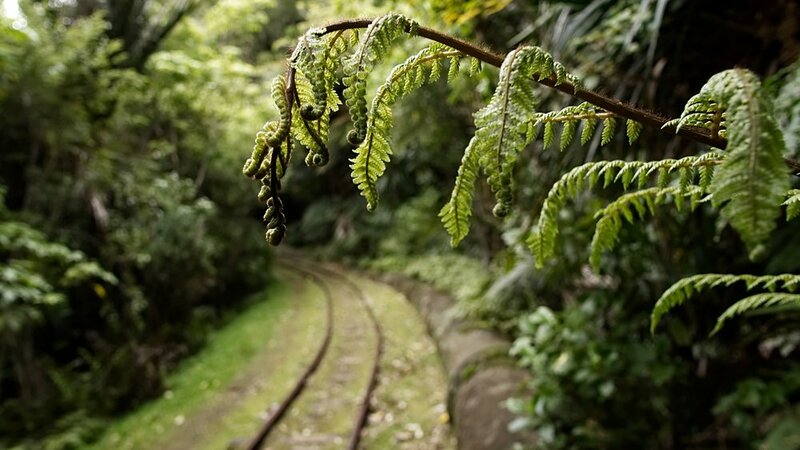 The next time you're outside, keep your eyes open for ferns. It most likely won't lead you to hidden treasure, but it might just lead you to an appreciation of something ancient and unique.